Find out more about the research behind the survey? Earthworms increase soil fertility and carbon storage by mixing in dead plant material. Mapping these benefits is not yet possible because we do not know how many and what types of earthworms there are in UK soils. Data from soil in urban areas is particularly lacking, despite gardens and other green spaces making up a large percentage of urban space (e.g. 14% of Greater London). Globally, soils store roughly 80% of terrestrial carbon, meaning it’s vital that we better understand how soil carbon stocks - as well as the other benefits earthworms provide - are affected by our management of soils. Your survey will be used to map these key benefits – productivity, flood protection and carbon storage – that are mediated by earthworms in the UK, and to predict how the maps might change under different possible futures. If you want to get more involved, after you’ve done the main survey you can also do experiments to test how gardens and other urban green spaces can be managed to promote earthworm populations and enhance the benefits they provide. The main survey requires digging a soil pit in two areas of different habitat e.g. lawn/flowerbed or management e.g. fertilised/unfertilised. For each soil pit the habitat, number and types of earthworms, and soil properties are recorded. This paired study design means that each participant’s data provide a ‘fair test’ - an essential component of the design of a scientific study. Because each participant compares two sites, their data will tell us about the relative numbers of earthworms at the two sites even if some people are better at finding earthworms than others are. This paired design avoids the main problem with analysing citizen science data. How do the abundance and diversity of earthworms respond to different land uses and land management as well as to other environmental conditions (e.g. soil moisture, texture)? How do three ecosystem benefits provided by earthworms – soil carbon storage, soil productivity and flood protection – vary across the UK; and what is the total amount of carbon in UK garden soils? What land management approaches help keep soils healthy? 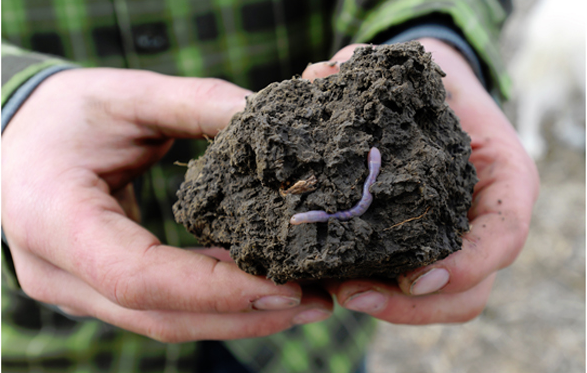 How will earthworms and their benefits change under different types of land-use change? We will use advanced statistics called mixed-effects models (as used in Newbold et. al. 2015) to focus on comparisons between plots sampled by the same participant to estimate the effect of changing the soil use would have on earthworms and to estimate the amount of carbon stored in soil in the UK. Because we compare soil pits surveyed by the same person on the same day, it does not matter if the weather is different, if some people are better than others at counting earthworms or different parts of the country have more earthworms. Maps of benefits will be generated by combining data on water tables, soil type and climate with relationships between earthworm assemblages, soil fertility and drainage rates. Carpenter, D. et. al. Mapping of earthworm distribution for the British Isles and Eire highlights the under-recording of an ecologically important group. Biodiversity and Conservation 21(2) 475–485 (2012). IPCC. Summary for Policymakers. In Climate Change 2007: The Physical Science Basis. Contribution of Working Group I to the Fourth Assessment Report of the Intergovernmental Panel on Climate Change. Cambridge University Press, Cambridge, United Kingdom and New York, NY, USA. Newbold, T. et. al. Global effects of land use on local terrestrial biodiversity. Nature 520, 45-50 (2015). 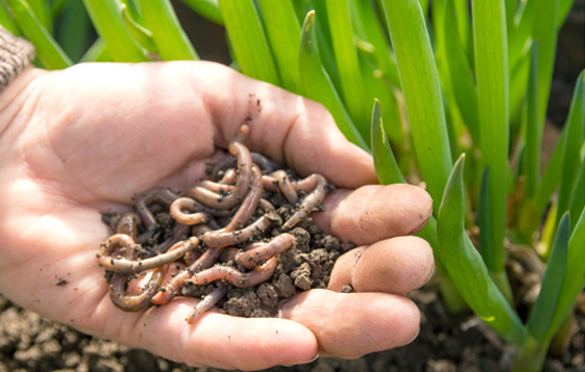 Earthworms can be divided into three groups according to their lifestyle, and they affect the soil in different ways. Are more than 15 cm long when adult and can grow as long as 30 cm! They are dark reddish-brown in colour often with a nearly black head. This type of earthworm makes deep vertical burrows into which they pull leaves to eat during the night - locking carbon into the soil. The entrance to their burrows may be covered by a ‘midden’ - a pile of grass stems, leaves or stones which protects them from predators, heavy rain and drying out. There are only three species of deep-living earthworms in the UK. These are less than 15cm long when adult and are reddish-brown in colour. They do not make burrows but live on or near the surface of the soil and eat dead leaves, breaking them down into compost. This is our largest group of earthworms in the UK, with 12 species. These are pale in colour - usually pink, but may be blue-ish or green-ish. They live and feed in the top 20cm of soil, rarely coming to the surface. They make horizontal burrows as they feed on the soil, which help mix air into the soil and improve drainage. There are eight species in the UK. In addition, participants who have completed the main survey have the opportunity to do an experiment by making a change to one of two plots (e.g. adding nutrients in the form of vegetable waste) waiting a month, and then sampling both plots. Earthworm Watch citizen scientists will help to answer the following questions: How do the abundance and diversity of earthworms respond to different land uses and land management as well as to other environmental conditions (e.g. soil moisture, texture)? How do three key ecosystem benefits mediated by earthworms – soil carbon storage, soil productivity and flood mitigation – vary across the UK; and what is the total amount of carbon in UK garden soils? What land management approaches help keep soils healthy? 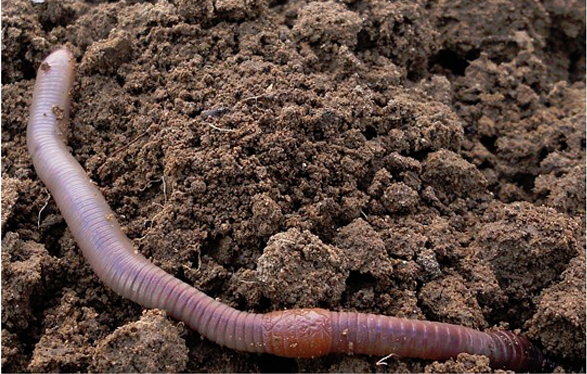 How will earthworms and their benefits change under different scenarios of land-use change? Carpenter, D. et al. Mapping of earthworm distribution for the British Isles and Eire highlights the under-recording of an ecologically important group. Biodiversity and Conservation 21(2) 475–485 (2012). Newbold, T. et al. Global effects of land use on local terrestrial biodiversity. Nature 520, 45-50 (2015).